Welcome back to the Witch World, readers! This book – Year of the Unicorn – takes place in the Dales of High Hallack, the western continent of the Witch World. We are in uncharted, amazing territory here. Let’s dive in! The long war between the Dalesmen and the Hounds of Alizon is finally over. The uniting of the Dale Lords, coupled with the loss of their support from the alien Kolder, weakened the Hounds’ ability to fight the Dalesmen, to be sure. But even this was not enough to secure the victory of High Hallack over the invaders. No, only one thing tipped the balance in their favor toward the end of the war. That was the appearance of the Were Riders on the side of the Dalesmen. You are probably wondering who or what the Were Riders are, aren’t you? 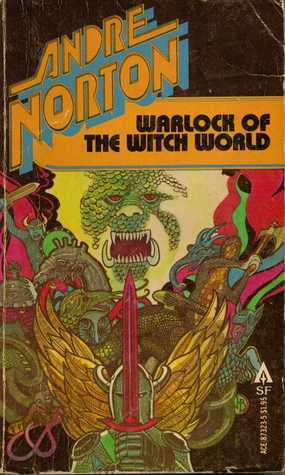 Bespelled by an Adept in the hidden realm of Arvon, which is sealed off from the rest of High Hallack, the Were Riders are men who can turn into animals. They have other magic as well, of course, but the Dalesmen know them best for their ability to assume the forms of beasts and birds. There are roughly thirty members of the Were Rider “Pack,” as they call themselves. And they agreed to enter the war on the side of the Dalesmen on one condition: after the war was over, the Dale Lords would provide the Riders with thirteen maids of marriageable age. They were to be comely and without illness or some other blemish, and they were to become the brides of thirteen of the Riders. The Pack was exiled from hidden Arvon to the rest of High Hallack; they did not come here willingly, they were banished. But their time of exile is nearly ended. Once it is done they will either be allowed to reenter Arvon – or they will be stuck in High Hallack for the rest of their lives. If that last occurs, they do not want their people, such as they are (all the Riders are male), to disappear. The only way to preserve themselves as a race is to marry. At the Abbey of the Flame in Norsdale, Gillan helps the Dames at their daily tasks. Taken by the Hounds from a land across the sea, she remembers nothing of her real home or people. Gillan only remembers scraps of the sea voyage and being rescued by Dalesmen raiding her captors’ ship when it arrived in port. The Lord Furlo led the raid which rescued Gillan and so his wife, Lady Freeza, kept her as a fosterling. They retreated to the Abbey when he was killed and their Dale taken by the enemy. The strain of both losses, however, was too much for Lady Freeza and she died, leaving Gillan in the care of the Dames. While grateful for the Dames’ protection over the years, Gillan has begun to feel trapped in the Abbey. Her chance to escape comes when the selected brides for the Were Riders stop by to take advantage of the Dames’ hospitality – and to pick up a couple of brides to fill the quota along the way. One of these prospective maids, a girl named Marimme, goes off into hysterics when she learns what her guardian has in mind for her. 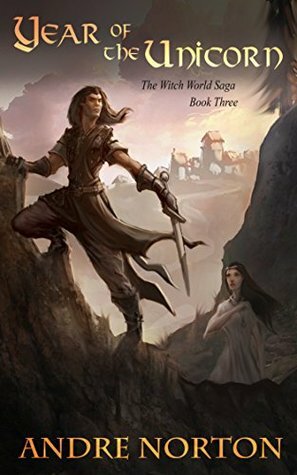 Seizing her chance both to help the poor creature and to escape the Abbey, Gillan knocks the girl out and takes her place, joining the other twelve brides on their journey to meet the Were Riders. By the time her deception is discovered it is too late to send her back, and so Gillan goes with the other young women to meet her future husband. The Rider she chooses is Herrel. Herrel is not a full Were Rider; he is not as powerful as the rest of the Pack. And Gillan did not choose him because she was bedazzled by the marriage spell he and the other Riders used to call their new wives to them; somehow, she could see past the illusion. Nevertheless, she chose Herrel as her husband. Herrel soon puts two and two together, realizing in the process that Gillan is not like the other girls or even of High Hallack. But because he is not as powerful as his fellow Riders, he cannot protect her from anything they try to do to her if they discover her power. So he asks Gillan to pretend the illusion the Pack keeps up for the benefit of the other brides is real, in order to protect them both from trouble. If you think she says no, you would be wrong. If you think Herrel’s hope to keep Gillan’s ability secret gets exposed, you would be closer to the mark, readers. 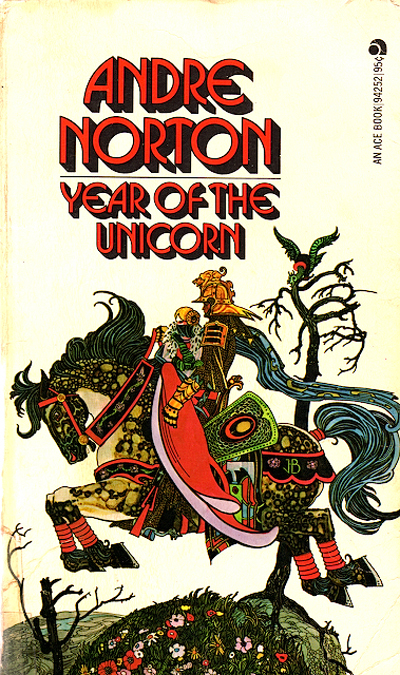 Year of the Unicorn is one of the best novels Miss Norton ever wrote; after the Falconers, I think I love the Were Riders best out of all her fictional races. They are just as cool and mysterious as the men of the Eyrie who, despite their practices, have always intrigued me. In one of her essays, Miss Norton said that Year of the Unicorn is a retelling of Beauty and the Beast. I leave you, readers, to discover how they are alike. No more spoilers here; go out and get the book yourselves. You won’t regret it! 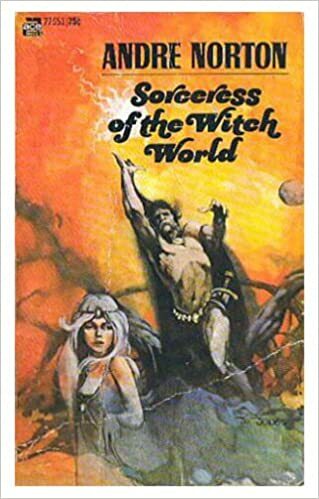 This entry was posted in Book Reviews and tagged Adepts in magic, Andre Norton, Book Reviews, Estcarp, Falconers, Fantasy/Sci-Fi, Grand Dame of Science Fiction, High Hallack, magic, sci-fi books, sci-fi novels, Sci-fi/Fantasy, Science Fiction, Were-Riders, witches, Year of the Unicorn on February 16, 2018 by The Mithril Guardian.